This assessment of the implications of the Venice Commission report published today on the euObserver is probably as good as any you’ll read. It presents the problem of hesitation for those at the EU who could do something about this because Joseph Muscat argues that the weaknesses in Malta’s constitutional makeup are a problem handed down to him since the days of Ġorġ Borġ Olivier. Of course, there are reasons why these issues came to the fore now, half a century since these laws were designed. It’s the toxic combination of weak constitutional safeguards and a government led by people keen to exploit those weaknesses for their own profit. 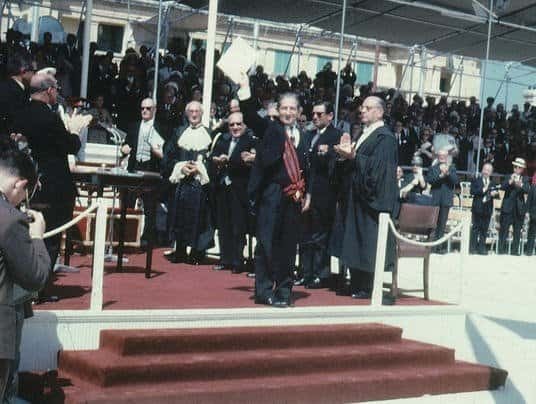 Ġorġ Borġ Olivier followed up Independence from Britain with membership in the Council of Europe and Associate Membership of the then European Economic Community immediately choosing the path of western liberal democracy for newly independent Malta. Dom Mintoff had other ideas. And Karmenu Mifsud Bonnici openly declared he would be all too happy to “suspend democracy” if doing such a thing would serve the national interest. Naturally, that would be the national interest as he would understand it. Both of them over-stepped their powers but were somehow restrained when the Opposition PN regrouped and pushed back. Eddie Fenech Adami sealed Malta’s desire to consolidate democratic values with membership in the European Union putting us in the situation we find ourselves in now where someone out there, even if timidly, gets to challenge us for electing a government so keen to depart from basic European norms of democratic life. We are held against an objective standard against which we are failing. euObserver speaks to experts who remark that Poland and Hungary are only a more urgent problem than Malta because they are retreating in the direction of depths we are already well and truly sunk in. There’s really one conclusion from all this. Constitutional limits need reviewing and refining but a government willing to breach the rules we have will be willing to breach new ones as well. Are Peter Grech and Lawrence Cutajar unwilling to prosecute criminal politicians because their jobs are in the grace and favour of the prime minister? Or is it because they are wimps that are happy to serve the interests of the prime minister as if they were their own? And even if a new constitution were to safeguard more clearly their autonomy and relieve them of all the conflicts of interest they are bound with today, is there any guarantee that a different Lawrence Cutajar and a different Peter Grech would behave any differently if serving a different Joseph Muscat? Would Glenn Bedingfield ever consider doing his job properly as an MP to hold the government to account rather than serve as its propagandist, if rules banning his simultaneous employment in the public service were enforced and he was instead given a full-time MP salary? Or will he just be an overpaid government propagandist with even more time on his hands instead? Is there any certainty that Consuelo Scerri Herrera would not have been promoted to judgeship if her brother’s colleagues in government could no longer ride roughshod over anyone’s better judgement? Are we certain that a President chosen by cross-party consensus in Parliament would be any more forceful than Marie Louise Coleiro Preca ever was in demanding from the prime minister that he does not protect Ministers in office when suspected of crimes? You see it’s not just about the rules. It’s about the people. It’s not just about the independence of the judiciary, the separation of powers, the constitutional checks and balances, the institutional autonomy. It’s about the character of the actors that play these roles: about the Lawrence Cutajars, the Peter Grechs, the Consuelo Scerri Herreras, the Glenn Bedingfields. Above all it is about who is at the centre of this maelstrom and how that person wields power. Dom Mintoff, Eddie Fenech Adami and Joseph Muscat, and all their successors and predecessors did not and do not wield power merely by reference to the Constitution (though I don’t mean to suggest that’s irrelevant by any means). They wield a deeper, cultural and transactional power that needs more than good Constitutional texts to manage and restrain within the limits of decency, goodwill and fundamental liberal and democratic values. For that, there needs to be a community conscience which is greater than the leader: a morality we share as a community, a democratic culture and citizens that are self-aware and responsible and to which any prime minister (or, I sincerely hope not, an executive president) would always feel subject and function in fear of. And you would need women and men of character occupying positions of public service, or if not, men and women of character who step out of their narrow private interests into the public space of civic discourse, to outstretch their arms and lift their hands palm outwards halting the greedy encroachment of democratic liberties by a gang of crooks like the bandits who have stolen our country from us. Let’s be careful now. The debate about improving our basic laws is fascinating and could prove a useful legacy for future generations. But if you’re not seeing Joseph Muscat getting over the tactical mishap of finding himself agreeing with reforms he objected to throughout his term and getting comfortable in the role of enlightened law-giver, he’s already running ahead of you. He is finding ways he could still win from this. And he’s only interested in one victory: the preservation of his power and the protection of whatever he has managed to secure for himself in the time he’s had so far, safe from an overly inquisitive successor in whatever executive role he is made to vacate by the normal course of democratic time. There are many ways in which a constitutional reform program could give him the keys to a peaceful coup d’etat. Joseph Muscat understands that if after all the drama of the last two years a revolution proves necessary, the best thing for him to do from his own point of view would be to lead it. I read a good piece on The Guardian today that admonished those who assume that democracy dies in darkness. It doesn’t. It dies in broad daylight with thunderous applause. The Venice Commission report is not divine intervention. It is an opportunity, whether for the country’s benefit or for the benefit of Joseph Muscat’s gang will depend on how switched on we are.